The 255-200 Series Evaporation Stations are complete systems used to measure the amount of water lost each day to evaporation. Daily observations of the water level in an evaporation pan are taken using a graduated hook gauge or a fixed point gauge. The 255-200 Series Manual Evaporation Stations are complete systems used to measure the amount of water lost each day to evaporation. 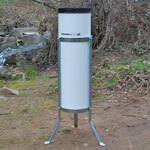 (Automated evaporation stations are also available.) There are two commonly used procedures for making these measurements. 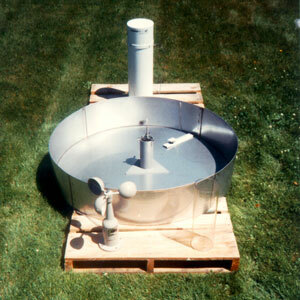 In both, a US National Weather Service Class A Evaporation Pan, 10 inches deep and 47.5 inches in diameter, holds the water and is normally installed on a wooden platform set on the ground in a grassy location. One alternative for measuring the daily evaporation loss is to use a graduated hook gauge set on a stillwell to determine the water level in the pan. The hook gauge is adjusted until the point just breaks the water surface, and a reading is taken from the attached scale. The second alternative uses a stillwell with a fixed point. 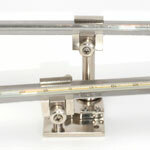 Each time a measurement is taken, the pan is refilled to the level of the point using a calibrated graduate. The graduate has a surface area of 1/100 that of the pan, so that the amount of water added is the equivalent evaporation. The choice between these alternatives is generally made on a practical basis, such as the availability of daily replacement water. The US National Weather Service standard evaporation and climatological station requires daily observations to collect the data; thus, it is not suitable for remote, unattended locations. The recommended layout of the plot and instruments for a station in the northern hemisphere is shown in the diagram. The 16' x 20' plot is the minimum for the equipment shown. 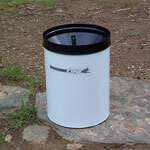 Accessories such as a rain gauge wind screen would require enlargement of the plot to 20' x 20'. This station should be installed on a sod surface where obstructions are no closer than 4 times their height. Shadows should not fall on the evaporation pan except for brief periods at sunrise and sundown. NovaLynx can provide the instruments to satisfy U.S. National Weather Service requirements. The amount of evaporation is a function of temperature, humidity, wind, and other ambient conditions. In order to relate the evaporation to current or expected conditions, the maximum and minimum temperatures of the water and the amount of air passage are normally recorded along with evaporation. Instruments for measuring air temperature, humidity, rainfall, and other parameters are described in their respective catalog sections. Box size: 50" x 49" x 11"